2 Bedroom Terraced Cottage For Sale in Penzance for Guide Price £215,000. 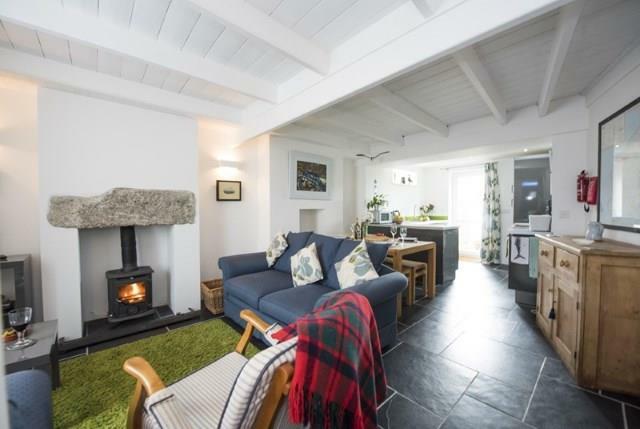 This stylish Cornish cottage lies between St Just and the peaceful Cot Valley. This cottage is beautifully presented and modernised and has a small garden to the rear. The living accommodation comprises in brief; open plan living area with wood-burner and an open plan kitchen area on the ground floor. The first floor hosts two double bedrooms and one shower room. Outside to the rear is a paved enclosed garden with two useful outbuildings. Two windows, hanging hooks, shelving and door into main living accommodation. Original restored 16 pane sash window to front aspect, shelving, exposed granite fireplace with multi fuel stove with slate hearth. Modern electric radiator. Galley kitchen with range of high gloss stylish base and wall units, with integrated fridge and electric oven with electric hob. Electric radiator. Velux window, heated towel rail, wash hand basin, corner shower cubicle with electric shower and W.C. Spacious cupboard with plumbing for washing machine and hot water cylinder above. Two slim picture windows to both sides, under stair storage cupboard with hanging rail. Electric Radiator. To the front of the apartment is a small garden with palm tree, perfect for outside seating.